Difference between revisions of "Ohio's State Prehistoric Monument"
This map shows the Newark earthworks. It is the largest set of geometric earthworks ever built. 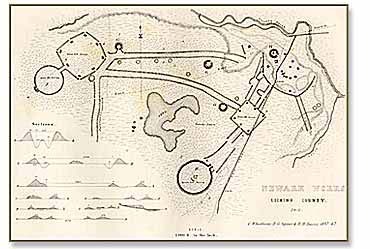 The Newark Earthworks were some of the largest geometric earthworks ever built. They originally covered more than four square miles, and more than seven million cubic feet of earth were used in their construction near what is now Newark, Ohio. A people we now call the Hopewell culture (an archaeological distinction based on characteristics of common artifacts and informed inferences about technologies) built these enclosures sometime between 100 B.C. and 400 A.D. The earthworks included a large circular enclosure (the Great Circle Earthworks), another slightly smaller circle that was linked to a large octagon (Octagon Earthworks), a large, nearly perfect square enclosure (Wright Earthworks), and an oval earthwork surrounding a dozen conical and loaf-shaped mounds. In addition, there were many smaller circular earthworks, a scattering of other mounds and pits and, on the opposite bank of the Licking River's South Fork, yet another square enclosure and an oval earthwork encircling the top of a hill. These major elements were interconnected by a series of parallel walls that may have served as sacred roads for participants in periodic rituals. This complicated group of monumental earthworks caused nineteenth century archaeologists Ephraim Squier and Edwin Davis to say that it was "impossible to give anything like a comprehensible description of them." During the last decades of the twentieth century, scientists asserted that the Octagon seems to incorporate the cycle for the Moon's rising and setting in its walls. Modern archaeologists refer to Newark and similar sites as "ceremonial centers," but they do not know the full range of activities of the Hopewell people at such places. Although much of the Newark Earthworks were destroyed by the growth of the city of Newark, concerned citizens succeeded in preserving two major parts of the site. The Great Circle became the county fair grounds. The Octagon Earthworks became the summer campground of the Ohio National Guard and later, the golf course of Mound Builders Country Club. Wright Earthworks preserves a small corner of the square enclosure. In 2005, fourth grade students at William E. Miller Elementary School in Newark, Ohio, asked the State of Ohio to recognize the Newark Earthworks as Ohio's prehistoric monument. With the assistance of State Senator Jay Hottinger, the students testified before the Ohio Senate and the Ohio House of Representatives. Members of these two bodies accepted the students' proposal. On June 7, 2006, Governor Bob Taft formally declared the Newark Earthworks to be Ohio's prehistoric monument. The designation of the Newark Earthworks as Ohio's state prehistoric monument honors the ancient American Indian builders of this site. It also honors the early residents of Newark who found ways to include the earthworks in their own new settlement without destroying them completely. The Newark Earthworks are also recognized as a National Historic Landmark.